M Rodríguez Pallares, MJ Pérez Serrano (2017): “Decision-making and transparency of information and knowledge. The case study of listed media companies in Spain”. Revista Latina de Comunicación Social, 72, pp. 719 to 736. Introduction. Strategic management requires making decisions whose implicit risk can be reduced by making information and knowledge accessible. Thus, strategic management contributes to the transparency of companies. 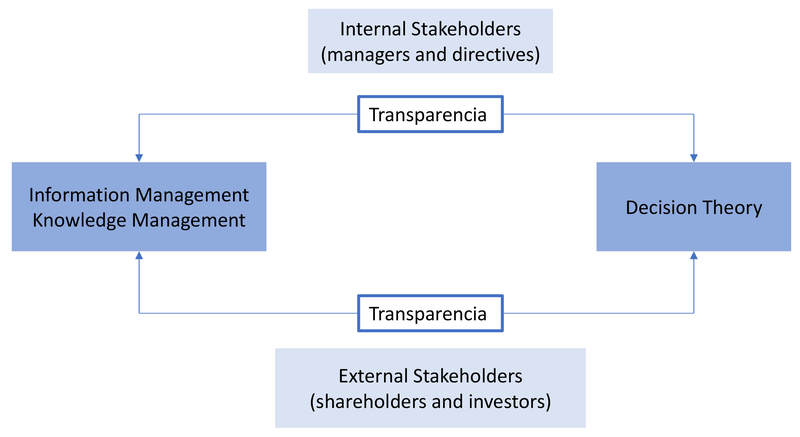 Based on this premise, the objective of this work is to analyse the contents aimed at shareholders and investors within the websites of five listed media companies operating in Spain -as an example of external transparency- in order to identify content and knowledge management models, if any, and determine the correlations that exist between transparency, decision-making and strategic management. Methods. The study is based on the examination of case studies through content analysis and non-participant observation. Results and conclusions. The results indicate that the sample of companies under study are transparent towards their external stakeholders, in economic-financial terms, which reflects the existence of a good corporate content management and favourable conditions for strategic or long-term management. In addition, the study has confirmed that, in terms of transparency, the sample of media companies are not different from listed companies operating in other sectors. Media companies; transparency; decision theory; information management; knowledge management. 1. Introduction. 2. State of the art review: decision theory in media companies. 3. Methods and materials. 4. Results. 5. Discussion and conclusions. 6. Notes. 7. References. Adaptation to a new socioeconomic paradigm, where regulatory movements and concentration have marked turning points, has meant that media companies have gone from operating in local environments to multiplying their reach and, hence, their level of competitiveness in the market. This way, the mass media have been forced to make “sectoral and individual improvements through research to identify new business avenues and make greater profits in the future” (Rodríguez-Pallares, 2012: 474) and find accommodation in the market. In other words, media companies seek to apply strategies and offensive or defensive actions to achieve a competitive advantage in the long term and position themselves comfortably in the market (Porter, 1999). This approach contextualises the object of this research study, which focuses on three closely interwoven elements: decision theory (E1); information and knowledge management (E2), and organisational transparency (E3), the nexus between the first two elements. The implementation of long-term strategies requires making decisions (E1), which is understood as a process that involves a risk, which is reduced with information access, and is conditioned by the personality of the executor (Pérez-Serrano, 2010), who is traditionally identified with a leader who, in pragmatic terms, is related to the person in charge of choosing one of several possible alternatives to solve an existing problem. Access to information, combined with knowledge, is conceived as a variable that reduces the chances of error in the decision-making process. Thus, the systematic management of these elements –information and knowledge– is essential for their storage, control and retrieval for subsequent strategic use (E2). The objective, therefore, is to ensure that decision-making processes are based on information, knowledge and relationships that go beyond the traditional resources and can translate into a source of competitive advantage if they are integrated into the planning and other activities of the company (Strandberg, 2010). From this perspective, the value of information and knowledge multiplies as a determinant variable of success in the context of the “intangible culture” (Carrillo and Nuño, 2010: 123), in so far as the internal stakeholders responsible for decision making depend on them. In addition, the projection of organisational information and knowledge towards the external stakeholders directly involved in the management of the companies, also has an impact on decision-making, so that the transparency (E3) of these contents is the result of good information and knowledge management and a vehicle for correct decision making. The existence of a two-way relationship between transparency and strategy seems justified, given that the definition of the latter is the result of a set of decisions. The study of media companies has led to the acceptance of proposals that grant them distinctive and conditioning qualities in their management style from an internal, structural and systemic perspective. One of these characteristics is their production, which is intangible in essence and is susceptible of being explicit and managed. In this sense, the value of media contents has been reinforced as the source and evidence of their activity, from a functional approach, and as a result of their management as production units, from a strategic approach (Rodríguez-Pallares, 2016). This way, two objectives traditionally linked to this sector are combined: the general one, which is to obtain economic benefits, and the particular one, which is to inform, educate and entertain with quality (Nieto and Iglesias, 2000). In this context, contents are understood as the concept that encompasses data, structured and unstructured information and explicit knowledge. The main objective of the management of these contents is the treatment and conservation of the funds in the digital organisational context, while the second objective is profitability based on re-exploitation. This process involves “technological components, business strategy and professional practices” (Fernández, Rodríguez and Rodríguez, 2013: 393) in order to facilitate the use and reuse of contents in the execution of work processes and the provision of services to users (Eíto, 2013). While access to information is a condition to reduce risk in decision-making processes, managing an organisation’s knowledge complements this action , since the collective knowledge of an organisation is closely related to its various functional areas (Nonaka and Takeuchi, 1999). In this sense, knowledge is understood as a “fluid mix of framed experience, values, contextual information and expert insight that provides a framework for evaluating and incorporating new experiences and information” (Davenport and Prusak, 2001: 6). Knowledge management is a comprehensive and systematic strategic process that oversees the know-how and know-who of the business activity in the business environment (Bueno, 1999; Nonaka and Takeuchi, 1999; Lai, and Chu, 2002; Eíto-Brun, 2013, Davenport and Prusak, 2001; Núñez-Paula, 2004, Spender and Grant, 1996). In other words, knowledge management focuses on a company’s intellectual capital -composed of human capital, structural capital and relational capital-, an intangible asset that confers distinction and excellence. It is, in short, to manage what the company knows and to enhance organisational collaborative learning as a resource to achieve a competitive advantage and apply strategies based on experience, which contributes, as mentioned, to the reduction of risk in decision making. The origin of the application of knowledge management in the organisational context, or what is the same, the knowledge-based economy, is related to the development of resource and capabilities-based theories and a more recent evolutionary approach based on the value of intellectual capital and knowledge (Navas y Ortiz 2002; Camelo Ordaz, 1996), whose foundations are linked to the theory of the “learning organisation” (Senge, 2005), as part of the organisational culture. Regardless of the dual origin of the theoretical basis of this management model, both routes converge on the idea of “giving value to the know-how of an organisation and safeguarding it, by making it explicit and democratising the non-explicit knowledge, through collaborative practices” (Rodríguez-Pallares, 2014: 158). In short, as the previous equation shows (Figure 1), information and knowledge are factors that reduce risk in decision making. Thus, decision-making has been traditionally linked to trust, which is embodied in the leader, but now this process must be linked to transparency towards the target audiences. As it was already commented at the dawn of this century, transparency starts with the definition, clarification and communication of the principles that constitute an economic production unit (Nieto and Iglesias, 2000: 145), which connects directly with organisational ethics and accountability that people and institutions must carry out within the scope of their functions (Olalla 2013). For Black (1994:195), organisational transparency is based on the “declaration of objectives by the company to indicate what kind of behaviour is mandatory within the organisation”, specifying the procedures that must be followed “from the highest to the lowest levels”. Therefore, it can be deduced that transparency falls upon the decision-making power; it is the trust attributed to the leader (entrepreneurs and subordinates), and affects the corporate image through the relationships established with stakeholders. Thus, the theoretical developments recommend commercial organisations to have a transparent management, that is, to inform society, in general, and stakeholders, in particular, about their actions and decisions in order to generate credibility and engagement, on the one hand, and to collaborate in decision making, on the other hand. This already became clear in the guidelines set forth in the ISO 26000 (CSR Guide), which recommends, in article 5.3.1, the establishment of a fluid dialogue between organisations and their stakeholders. In the same vein, the Spanish Law on Transparency, Access to Public Information and Good Governance (Ley 19/2013), presents a regulatory framework aimed at organisations and public institutions. Literally, it only applies to “companies whose social capital has over 50 per cent of direct or indirect participation from the institutions mentioned in this article” (Chapter I, article 2.1. g). In order to complement this gap in the case of trading companies outside the scope of the Law, the National Securities Market Commission (CNMV) published, in 2015, the Good Governance Code of Listed Companies, which is a guide on good practices and offers recommendations, five of which specify guidelines that request organisational transparency for all trading production units through their websites and, therefore, directly affect our object of study. Recommendation 4: The company should draw up and implement a policy of communication and contacts with shareholders, institutional investors and proxy advisors that complies in full with market abuse regulations and accords equitable treatment to shareholders in the same position. This policy should be disclosed on the company’s website, complete with details of how it has been put into practice and the identities of the relevant interlocutors or those charged with its implementation. a) Report on auditor independence. b) Reviews of the operation of the audit committee and the nomination and remuneration committee. c) Audit committee report on third-party transactions. d) Report on corporate social responsibility policy. Recommendation 7: The company should broadcast its general meetings live on the corporate website. Aspects linked to human resources and corporate governance. a) Background and professional experience. b) Directorships held in other companies, listed or otherwise, and other paid activities they engage in, of whatever nature. c) Statement of the director class to which they belong, in the case of proprietary directors indicating the shareholder they represent or have links with. d) Dates of their first appointment as a board member and subsequent re-elections. e) Shares held in the company, and any options on the same. H1: Transparency of contents and knowledge has an impact on decision-making and, therefore, on strategic management. H1.1: The existence of content and knowledge management models is essential for ensuring access to information by internal stakeholders responsible for the management of a company’s (internal) communication and to reduce risk related to decision making. H1.2: The existence of external communication channels that facilitate access to information and explicit knowledge by the external stakeholders interested directly in the management of media companies (investors and the so-called shareholders ), highlights the need for models to manage these intangible assets and organisational transparency variables. Phase 0: Identification and study of content and knowledge management models in the analysed cases. Phase 1: Observation and study of the organisations’ communication of information and explicit knowledge to its external and internal stakeholders. Phase 2: Analysis of the influence of contents and knowledge access on the organisations’ decision-making processes. Based on this reasoning, we aim to analyse Phase 1 and infer from an inductive logic, Phase 0 and Phase 2, and, thus, respond to the hypotheses. In other words, based on the study of the degree of transparency, we aim to deduce the existence of a management model for contents and operational knowledge and to identify a favourable context to reduce the risk involved in decision making in the long term. Based on the multiple-case method, the “existential (non-deterministic) and constructivist” type, which focuses on interpretation (Stake, 2007), we reduced the analysis sample to the websites of the five media companies with headquarters in Spain and listed on the stock market: Atresmedia, Mediaset Spain, PRISA, Vértice 360° and Vocento. TV Azteca is also listed in the Spanish stock market but was excluded from the sample because it has its headquarters in Mexico. ATRESMEDIA CORP. DE MEDIOS DE COM. “Atresmedia is a leading communication group in Spain, especially since 2012, year in which an important milestone took place: the process of integration of La Sexta into Atresmedia Televisión. Atresmedia directly manages seven TV channels, three radio stations, a powerful film production company and is at the forefront of the new digital media”. “Its main line of business is the sale of advertising slots in the seven television stations it operates (Telecinco, Cuatro, LaSiete, Factoria de Ficción, Boing, Divinity and Energy) and in the Internet, to develop them commercially through Publiespaña, Publimedia Gestión and the Commercial area”. “PRISA is present in 22 countries and reaches more than 60 million users through its global brands. It is one of the largest media groups in the world with an extraordinary range of assets. Its presence in Brazil and Portugal and among the growing Hispanic community in the US has given the group an Ibero-American dimension and has opened up a potential global market of 700 million people”. “The national, regional and local positioning of Vocento means that it can access areas its competitors cannot reach, reaching more than 30 million people, according to EGM. Its brands are in a privileged place to access information and entertainment from a multichannel perspective and adjusted to new technologies”. Source: Authors’ own creation with data from Bolsa de Madrid / García-Santamaría, Pérez-Serrano and Alcolea, 2014. O1: Identify external communication channels specifically generated for shareholders and investors. O2: Identify contents related to the financial and economic structure and the managerial action of the companies through these channels. After the sample selection, a coding sheet was designed (Figure 7) to establish a systematic pattern in the process of observation and quantification (Berelson, 1952; Bauer, 2000). 1. “Very high”, when the information is found by clicking up to two links, i.e., when the route does not require more than two actions by the user to access the desired content. 2. “High”, when up to four links are needed to gain access to the requested content. 3. “Good”, up to six links. 4. “Poor”, up to eight links. In addition, the analysis criteria have been categorised according to four specific aspects that contribute to the understanding of the degree of transparency of the sample of companies. Although the fourth criterion (communication aspects)  is not necessarily relevant to the management or economic-financial dimensions of the listed companies, it was included in the analysis because the corporate purpose of the study sample, the visibility of these contents, represents a remarkable degree of transparency and highlights the commercial characteristics of the media companies. To quantify the results, we divided the categories into positive (very high, high and good) and negative (poor and not found), in order to be able to answer, affirmatively or negatively, the research question (RQ): Are the companies in the sample transparent with their shareholders and investors? (I, II, III, IV) Or more specifically: Are the companies in the sample transparent, from the economic-financial perspective, with their shareholders and investors? (I, II, III). As mentioned, it seems obvious that decision making is much easier and less risky the greater the volume of available information and knowledge and the more “decision models” are implemented within the business structures to provide a precise description and understanding of reality. Thus, through better and more accurate knowledge, companies can make more appropriate decisions and, if necessary, modify them according to their business interests, dynamics and prospects of the moment. Environments of certainty: where the decision-maker knows for certain the facts on which the decision depends and on which the decision-maker has little or no degree of control (states of nature).
. Environments of structured uncertainty: where the different states of nature are known, but the probability assigned to each of them is unknown. Environments of unstructured uncertainty: where the degree of information is minimal, and not even the possible states of nature are known (Sevillano, 2001). The fundamental difference between the different environments lies at the level of information available and, consequently, the degree of information transparency that companies offer. Along this line, following the content analysis, we observed that the positive features of transparency outweigh the negative ones in all companies that were subject to study, with the exception of Vértice 360° (44.79% of positive transparency results and 55.21% of negative transparency results). Mediaset has the highest percentage of positive accessibility to the contents assumed as items of analysis, reaching 65.42% of positive transparency, against 34.68% of negative transparency. Very close behind is Vocento, with 63.54% of positive accessibility and 34.46% of negative accessibility. PRISA and Atresmedia obtained equal results in this comparison, with 56.25% of positive content accessibility and 43.75% of contents that are not well located or require more than six clicks from the user to reach the desired information. Data vary with regards to the question: what listed media companies are more transparent, according to the average results derived from the Likert scale (that is, the results registered individually without grouping them into positive or negative). 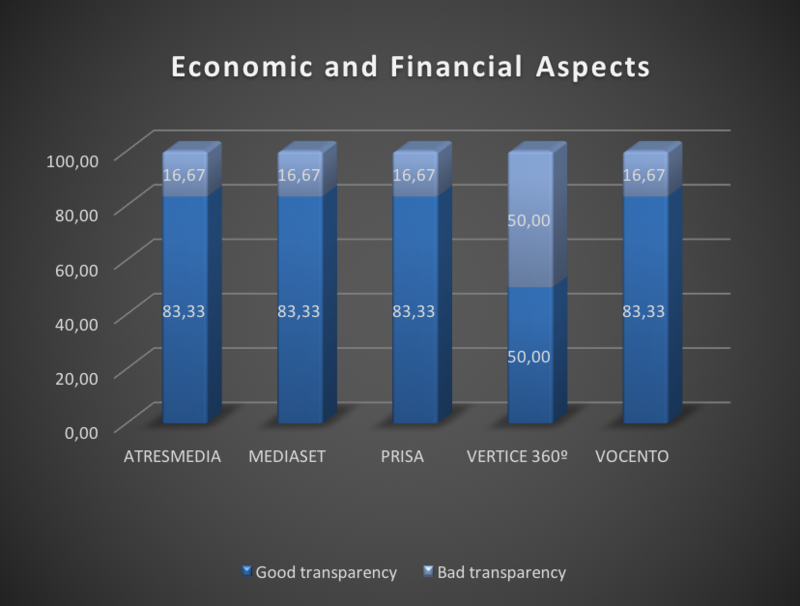 Vocento holds the first position of in terms of information transparency and accessibility, with 62.5%, while the percentage of transparency of Mediaset goes down to 35.46%. This difference, based on the analysis criteria, shows that in the case of Vocento the informational contents analysed in general are more accessible, that is, they require the user less clicks to navigate across the website. For example, although the analysed companies make their contents available to shareholders and investors, which gives them the status of transparent, not all of them offer the same accessibility criteria, which affects the user experience (UX). Examining the different criteria individually (I, II, III, IV), the results reveal, again, slight differences with regards to the accessibility of the contents aimed at shareholders and investors in the websites under study. 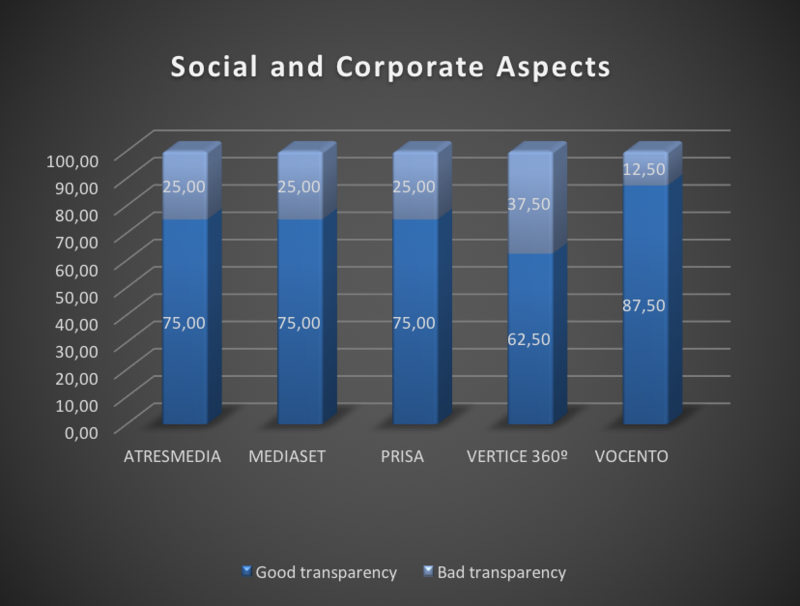 In terms of social and corporate aspects, Atresmedia, Mediaset and PRISA obtained similar results: Vocento’s website has the most ease of access, with 87.5% of positive results; while Vértice 360°’s website is the least transparent, with only 62.5% of transparency, although its access is very high, high, or good. Something similarly occurs with economic-financial contents: Vértice 360° offers balance between good and bad accessibility to contents according to the items considered for this variable, while the oldest listed companies in the sector are more transparent, i.e. they simplify the accessibility of the contents presented in their corporate websites. 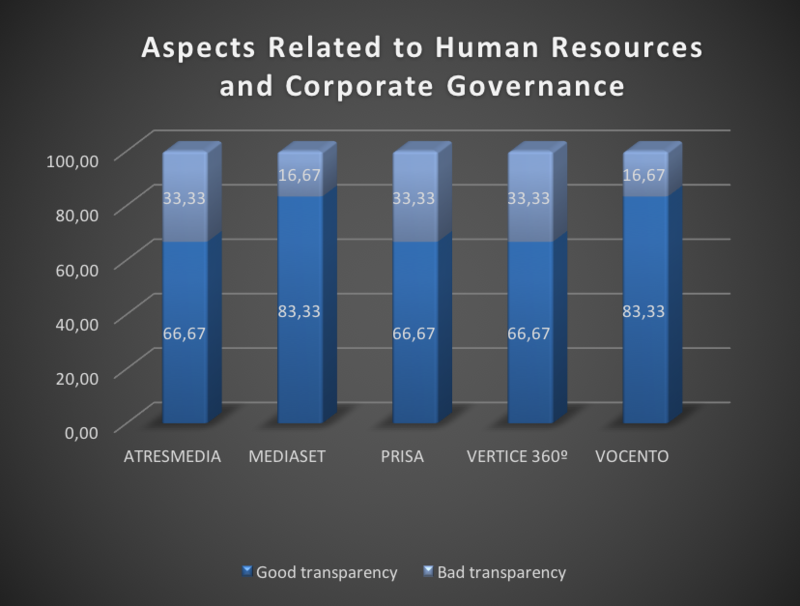 On issues related to corporate governance, Mediaset and Vocento not only provide more results, but also do so in a more accessible way. While access to information concerning the composition of corporate governance, registered address, staff and salaries is positive in all the cases, it is important to highlight that -except for Vocento- there is an absence of the organisational chart in some cases and, in others, of contents linked to CSR in the spaces dedicated to shareholders and investors in all the websitesanalysed. Vértice 360°, is another exception although the information displayed in its website is little accessible. Finally, the results concerning the IV criteria, communicational aspects, reveal that, except for Mediaset, which offers broadcasting and audience data, these aspects are not conceived as a priority to enhance the informative offer aimed at shareholders and investors. That is, media companies do not offer contents related to their functional activity to shareholders and investors, limiting communication with these stakeholders to aspects related to the trading company as an economic production unit, leaving aside its corporate purpose. Based on the content analysis and the quantification of results, the study has confirmed that, from an economic and financial perspective and according to the means obtained on the criteria I, II, and III, the analysed sample is transparent in 75% of the online contents, which have been categorised as positive. However, if we add the communication aspects (IV) to the corporate (I), economic and financial (II) and corporate (III) aspects, the percentage of transparency in the websites goes down to 57.25%. This difference in results shows that the sample of companies, despite having the particularities that their corporate purpose grants them from the commercial and administrative point of view, are not different from listed companies operating in other sectors with regards to transparency with their shareholders and investors. If we undertake the reasoning process in the opposite direction, i.e., if we apply a deductive logic, it can be said that, given that the degree of transparency in the online communication channels is high (75%), in managerial and economic-financial terms, we can assume the existence of a management model for content and explicit knowledge (H1.2) that facilitates the transference of these types of information in the analysed websites and thus ensures access to information by external stakeholders. While it is impossible to confirm based on the study the centralisation of all contents generated by the business activity in the same data repository (Rodríguez-Pallares, 2016), it is feasible to point out that H1.2 is confirmed in functional terms in the field of study under analysis. These results, which confirm a high degree of external transparency and demonstrate the existence of management models for content and explicit knowledge in the corporate and economic-financial field, allow us also to deduce that there is access to these contents by internal stakeholders (responsible for the business management) (H1.1), which has an impact in the decision-making process and, therefore, contributes to long-term management in the long term, which confirms H1. Finally, it is necessary to clarify the specific character of the organisational area that was used to quantify and evaluate transparency: the one concerning the management and financial processes. This particularity implies that we cannot extrapolate these results to all areas of a media company, although, based on the lucrative objective of commercial companies, the results are a clarifying example of the relationship of dependency between content and knowledge management, transparency or information access and the decision-making process in strategic management. While it is true that there is a debate regarding who depends on whom in content management and knowledge management (Rodríguez-Pallares, 2016), from the point of view of this project, both disciplines are understood as complementary (Nonaka and Takeuchi, 1999; Al-Hawamdeh, 2002; Newman, 1997; Pearson, 1999; Davenport and Prusak, 2001). Content management deals with the treatment of data, information and explicit or coded knowledge and, from there, but without disregarding it, knowledge management has a more complex objective: manage tacit knowledge, which implies socialisation processes (both face to face or technology mediated) that allow its democratisation and its protection within the organisational limits. For this reason, we reject the exclusive relationship in favour of the complementary relationship between content management and knowledge management. The so-called shareholders -shareholders and investors-, together with other stakeholders such as financial analysts and regulatory authorities (the National Securities Market Commission / CNMV) and economic institutions (Bolsa de Valores), make up the financial environment, community or group, which are a particularly relevant public in organisational management and communication processes, given that they condition, as parties involved, the activity of the production unit. This category includes relevant information about the setting principles, broadcast/audience, subscribers and followers on social networks and advertising (rates, formats, types). Criteria I.7. (Investor and shareholder office): is the specific site that brings together summaries of economic and financial information of the company in question to the first subjects of its intra-corporate relationships (investors and shareholders). Such information may also be collected in a more extended and detailed way in other places of the web. Criteria II.1. (Budgets): refers to the significant data about the budgetary basis of the media group. Knowing full well that the budget does not belong in the official advertising of the trading company, budget data would be considered a plus in the transparency of the company in question. M Bauer (2000): “Classical content analysis: A review”, in (Eds. M. Bauer & G. Gaskell), Qualitative Researching with Text, Image and Sound, pp. 131-151. Thousand Oaks, CA: Sage. B Berelson (1952): Content Analysis in Communication Research. Glencoe III: Free Press. S Black (1994): ABC de las Relaciones Públicas, Barcelona: Gestión 2000. M Carrillo & N Nuño (2010): “La documentación en la evaluación y gestión de la imagen corporativa”. El Profesional De La Información, 19 (2), pp.123-132. DOI:10.3145/epi.2010.mar.02. R Eíto (2013): “Madurez de la gestión de contenidos, ¿sinónimo de desgaste o de oportunidades?”. El Profesional de la Información 22 (5), pp. 377-380 DOI: 10.3145/epi.2013.sep.01. M Fernández-Sande, MD Rodríguez-Barba & M Rodríguez-Pallares (2013): “La gestión de contenidos como actividad estratégica en empresas de radiodifusión. Estudio de casos en la radio comercial española”. El Profesional de la Información 22 (5), pp. 392-398. DOI: 0.3145/epi.2013.sep.03. JV García-Santamaría, MJ Pérez-Serrano & G Alcolea-Díaz (2014): “Las nuevas plataformas televisivas en España y su influencia en el mercado”. Revista Latina de Comunicación Social 69, pp. 390-417. DOI: 10.4185/RLCS-2014-1017. V Newman (1997): “Redefining knowledge management to deliver competitive advantage”. Journal of Knowledge Management. 1 (2), pp. 123-132. I Nonaka & H Takeuchi (1999): La organización creadora de conocimiento: Cómo las compañías japonesas crean la dinámica de la innovación. México D.F: Oxford University Press. IA Núñez (2004): “La gestión de la información, el conocimiento, la inteligencia y el aprendizaje organizacional desde una perspectiva socio-psicológica”. Acimed: Revista Cubana De Los Profesionales De La Información y La Comunicación En Salud. J Olalla (2013): “La transparencia como un valor”, in Newfield Network. Retrieved from http://www.newfield.cl/newsletters-antiguos/la-transparencia. MJ Pérez-Serrano (2010): “Análisis del valor de las empresas informativas”. Palabra Clave, 13 (1), pp. 47-58. M Porter (1999): Ser competitivo. Nuevas aportaciones y conclusiones. Bilbao: Deusto. M Rodríguez-Pallares (2012): El capital intangible como clave estratégica en la empresa radiofónica española: El caso de la Cadena SER, in (Eds. M Fernández-Sande & A Adami) Panorâmica de Comunicação e dos Meios no Brasil e Espanha / Panorámica de la Comunicación y los Medios en Brasil y España, pp. 473-495. M Rodríguez-Pallares (2014): Análisis de los actuales modelos de gestión de contenidos y conocimiento en las grandes cadenas de radiodifusión españolas: SER, onda cero, COPE y RNE. PhD thesis: Universidad Complutense de Madrid. PM Senge (2005): La quinta disciplina: Cómo impulsar el aprendizaje en la organización inteligente. Buenos Aires: Granica. M Sevillano (2001): Teoría y práctica de la dirección de la Empresa Informativa (materiales docentes). Madrid: Complutense University of Madrid. JC Spender & RM Grant (1996): “Knowledge and the firm: Overview”. Strategic Management Journal (1986-1998), 17, special issue (5). DOI: 10.1002/smj.4250171103. RE Stake (2007): Investigación con estudio de casos. Madrid: Morata. Article received on 3 on March 2017. Accepted on 26 June.